Oh, Auckland, how much I love you! In case you did not know but I spend more than 6 years living in Auckland, New Zealand. I finished my Master’s degree here, and later worked as a Marketing Specialist. And still today, it’s one of those places that make my travel and foodie heart sing. 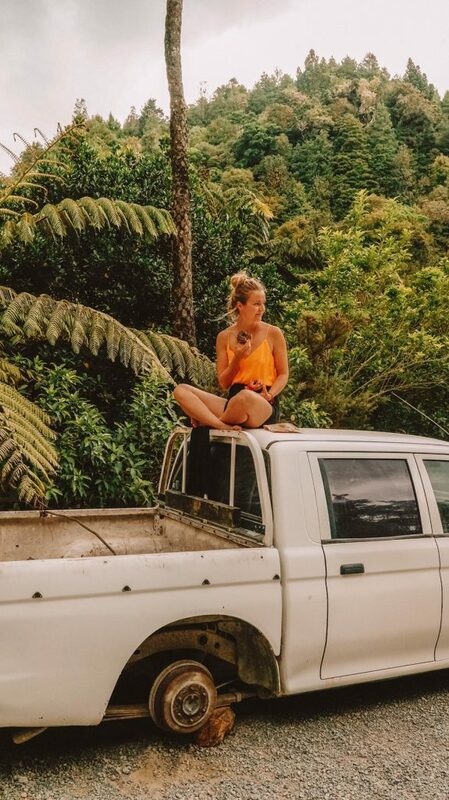 Usually, tourists don’t waste a lot of time in Auckland since they want to experience nature so hanging about is not a big thing. But secretly I think people are making a mistake by skipping Auckland, which to me, is probably best-kept food secret in Australasia. Whatever cuisine you crave, you will find it here. Is it trending right now? You will find it here. When I returned to Auckland this year, you can probably imagine that I had a long list of restaurants and cafes I was dying to visit. A list almost as long as the is Skytower high. 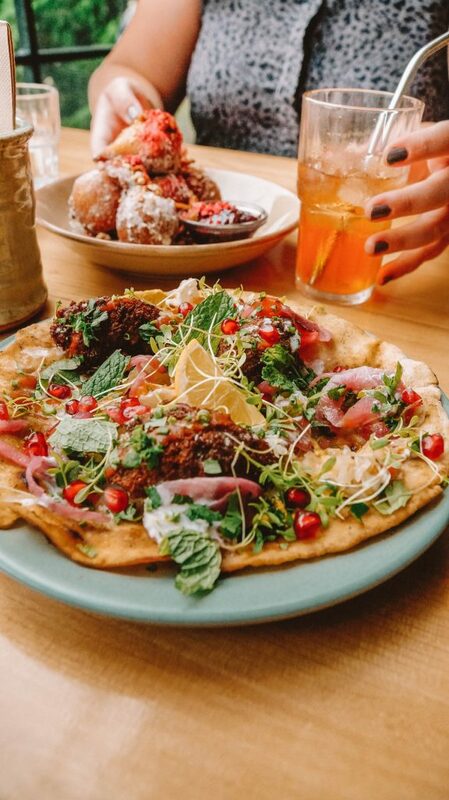 Now that I am back, I would love to share the hidden places and secret food gems in my Vegan Food Guide to Auckland with you. Welcome to Foodie Heaven. Ready to take a bite? 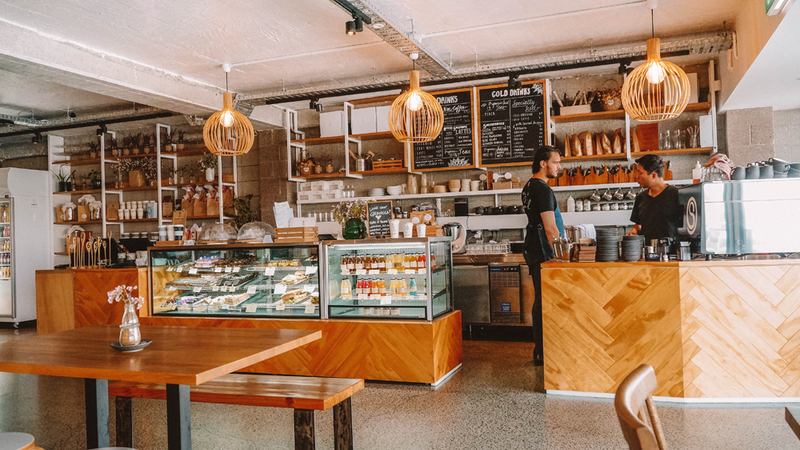 If you head to Bestie (which you should because St. Kevins Arcade is an Auckland must do for second-hand shops and specialty shops), make sure you grab one of the tables at the window. When you arrive there, you will know what I mean, window seats give you full views of the palm-lined tropical Myers Park framing the Auckland’s landmark, the Skytower. 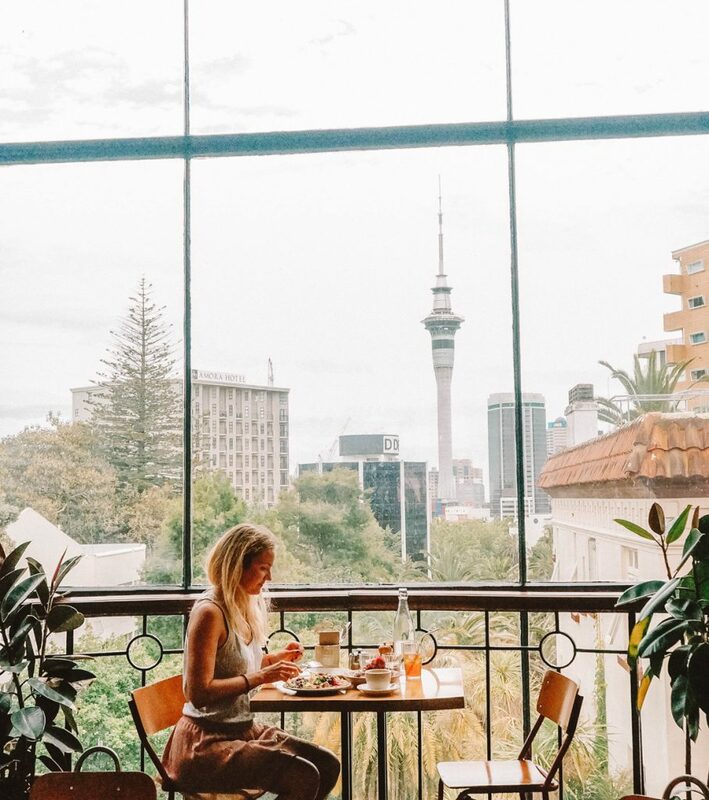 Yes, you heard right, while savoring the food you can actually see the iconic landmark of Auckland while feeling you are sitting in a jungle like setting. 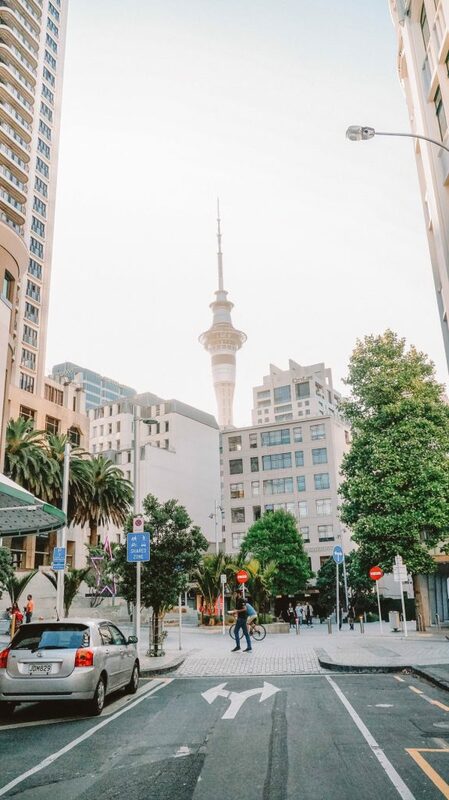 At Bestie you will hardly find any tourists despite of the Skytower views so it is your perfect chance to mingle with the locals and take your perfect Skytower photo. 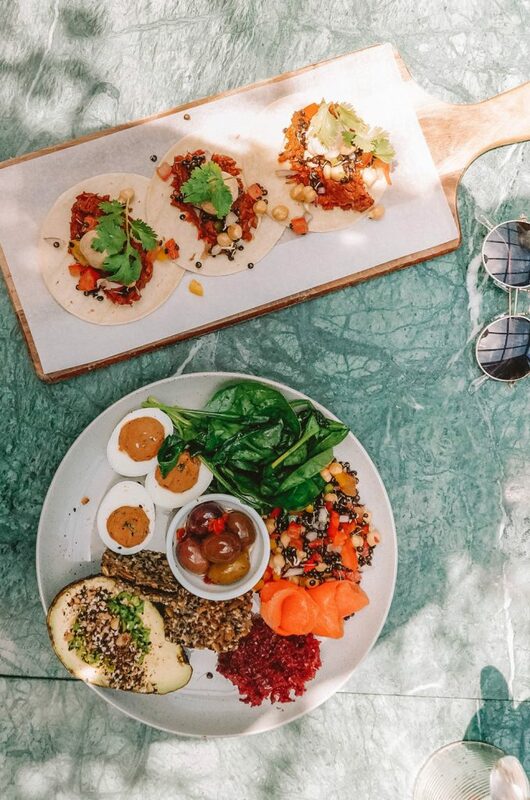 Bestie is not a strictly vegan place but they have some delicious plant-based breakfast and lunch options that were among the best during my Auckland food spree. We tried the breakfast donuts with pretzel crumbs and raspberry jam and the falafel lunch plate with pickled onions and hummus. Both dishes were flavorful and I wish I did have more tummy space for the sweets hiding inside of the cabinet. So make sure to check the cabinet food and cakes before ordering. Bestie also does amazing coffee and great plant-based milks. Not to be mixed up with the plant-based sister The Butcher’s Daughter in NYC. This is a kiwi venture located in hipster town, Ponsonby. But possibly because of the NYC sister restaurant my expectations were super high. We went with a big group so I got to try a great variety of dishes. Overall The Butcher’s Son is an all plant-based restaurant, and importantly one of few that open in the night for dinner service. I really loved the interior with lots of green and wood, also the staff was super friendly and attentative here. So what did we try? 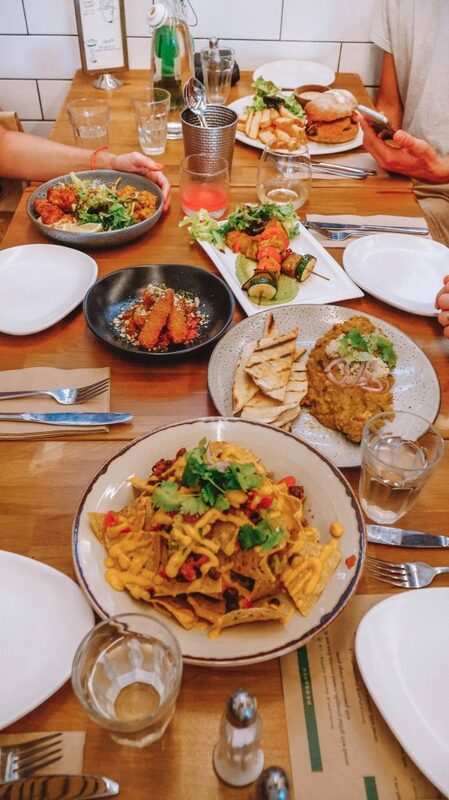 We had the sun-fed ‘Chicken’ Burger, the Buddha Bowl (which changes daily), the mozzarella sticks, Greek Tofu Kebabs, the loaded nachos with cheese sauce, the stuffed aubergine and heaps of their blackcurrant kombucha. I am usually not into dishes mocking meat but the Chicken Burger turned out to be my absolute favorite. It was flavorful, the patty was crispy and the fruity spicy chili jam was mouthwatering. Similarly, the other dishes were really tasty too. I was super excited over the mozzarella sticks but I thought they weren’t very out of the ordinary. I would have loved to come here for brunch as well as I did hear it’s really good. A selection of food at The Butcher’s Son in Ponsonby including Nachos, Mozzarella sticks, and Tofu Kebabs. If you happen to be on the North Shore in Auckland (which is right over the Auckland Bridge), it might be worth popping into Street Organics in Takapuna. The atmosphere is great and I could totally see myself spending a whole day relaxing in there. And you are super spolied for choice when it comes to their sweet collection of raw sugarfree cakes, slices and truffles. For a start, I tried their lunch Super Salad and the Vegan Creamed Mushrooms paired with a spirulina latte. Overall, the food was good and presented beautifully but it lacked that bit of excitement in taste for me. I also took away a selection of their raw cakes: the caramel slice, the ginger slice, and the cheesecake slice. They were all good, but again, I was missing a flavor punch. I also found the food quite pricey too. In saying that, I still think it’s one of the best bets to get healthy food into your tummy when you are over on the North Shore. As you can tell, Auckland really spoils anyone loving healthy plant-based food. But make sure you do not skip the queen of all raw cafes: Little Bird aka. The Unbakery. And they don’t call in Unbakery for no reason. All the food they sell here is raw and EVERYTHING is made from scratch: nut milks, cheeses, fermenting, baking. Little Bird really takes the meaning of wholefoods seriously. Created by founder Meagan Hay, it’s an institution in the raw NZ scene. So make sure you get a bite of it! 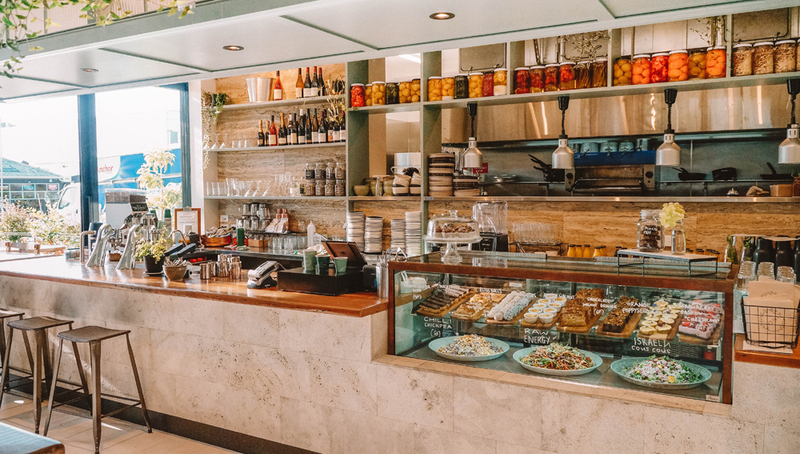 The buzzing modern cafe is cramped with young and old people alike who want a bite of the fully plant-based menu. We tried the Vietnamese crepes, the famous Bird Bowl, and for dessert, we had the passionfruit cake and the hazelnut tarte. We also had the thick chocolate shake and the strawberry smoothie. Without a doubt, Little Bird has managed to absolutely make every dish a winner that I tried. The passionfruit cake was a melt-in-your-mouth-tropical-flavor-explosion and the hazelnut cake was pure chocolate creaminess. Always go for dessert, Little Bird is famous for their raw cakes for a reason. On top of that, they have their own branded range of raw healthy crackers and raw macarons plus some zero waste goodies which you buy at the cafe too. This was by F-A-R my favorite place of the whole trip. Oh my gosh, you do have to come and eat here! KIND is out of this world beautiful. With hundreds of plants hanging from the ceiling entangled with string lights, you feel like sitting in a jungle glasshouse. Staff is crazy friendly and the hardest part was to decide which dish to go for. The cuisine is super innovative, food is amazingly presented and every single crumb on the plate was crazy delicious. Even the ceramics were to die for and all handmade in the NZ. Please note, KIND is not strictly vegan if that is important to you, they do feature eggs on the menu too but no meat. We went for breakfast and I chose the feijoa & mango coconut yoghurt (tasted like a creamy custard) with walnut granola & strawberries – every bite was to die for. We also tried the smashed bean sandwich and the jackfruit tacos which were equally delicious and almost too beautiful to eat. Along with their fabulous food, the owners of KIND live exactly what the name of the restaurant promises. They help to build a greener neighbourhood by promoting urban gardening, composting, workshops, fintess and instead of coffee cards, they plant a tree for every ninth coffee you have. Come here for breakfast, lunch or dinner. It’s worth checking out their cabinet food too with lots of cake and salads. 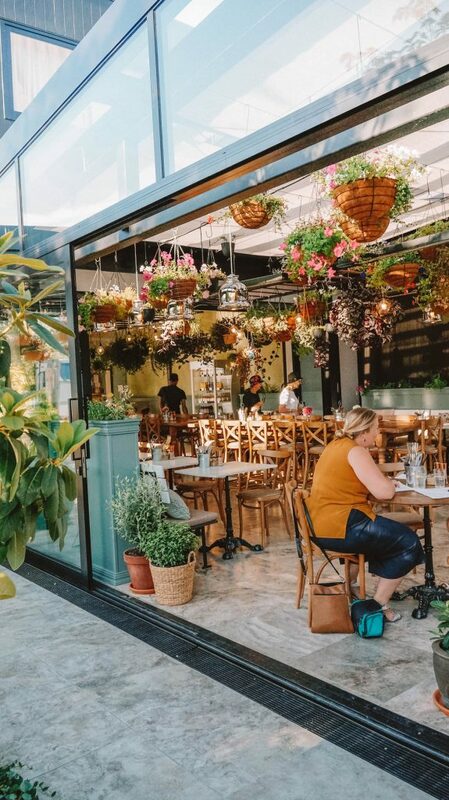 Nestled in a backyard of the Kingsland shops, entering Mondays Wholefoods is a bit like walking into a little greenhouse. 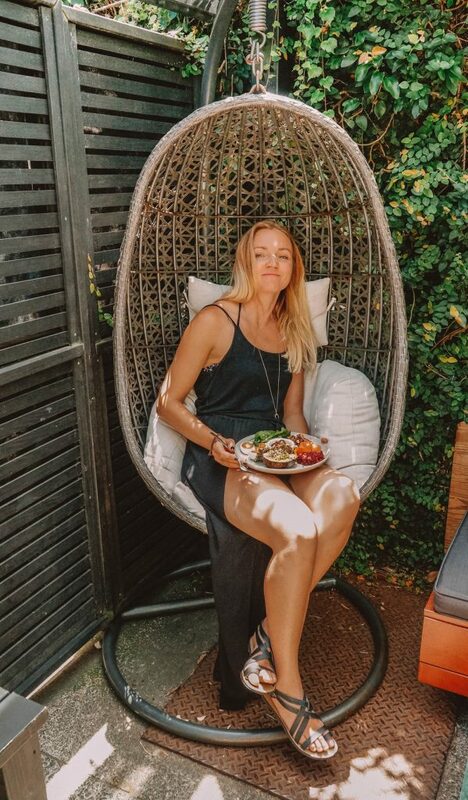 I really loved the whole vibe here with the wooden tables, couches and swing chairs. 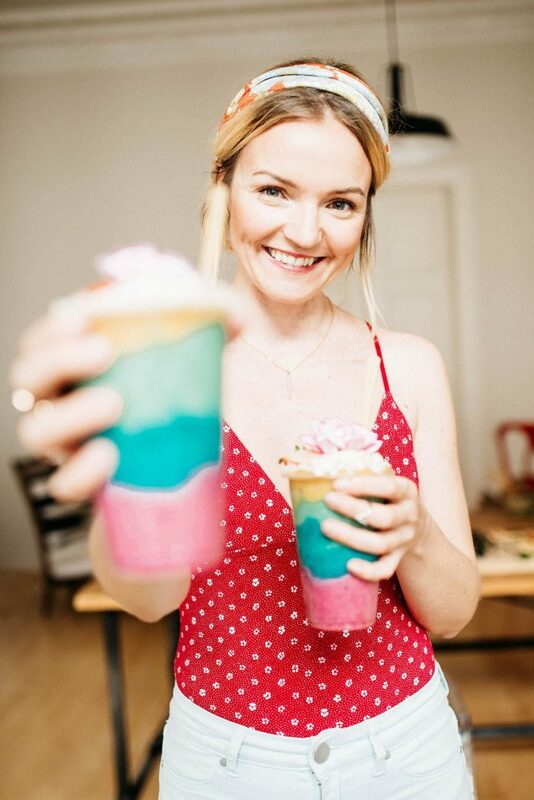 And vibe pairs perfectly with their colorful beautiful food. It’s also a really good spot to take photos of you and your dishes if that’s your jam. At Mondays, we had the KETO Feast bowl and the jackfruit tacos with vegan aioli. My tacos were delicious but the portion size was quite small whereas the KETO feast that my friend had was heaps. It is not an all vegan cafe, they do have eggs and meat too. Still, you will be absolutely spoiled for vegan choices here. Also, service was lovely and we felt like going on a little holiday sitting in the backyard chilling on the couches here. And inc case you are in need of a little holiday, Mondays also offer yoga classes and urban retreats. I found this gem of a cafe on my stroll through Parnell and immmideately fell in love the moment I set my foot in it. Everything screams California and it has an airy beachy feel with wooden benches, plants and big windows. It is one of those places where every smoothie bowl sounds better than the other and the cabinet overflows with healthy raw homemade sweets. The avocado toast is made is crispy, creamy and made to perfection served with a slice of lemon. CaliPress also serve fantastic matcha latte’s and cater for all health needs from glutenfree, vegan and raw. And of course, the names gives it away, they do cold-pressed juices and tonic shots at its best. Oh Tart bakery! A bakery selling vegan donuts, cream pies, tartes and pastries was the last missing puzzle for my vegan food guide. It is a super small shop on K’Road which you can visit after having breakfast at Bestie cafe. Their stuff is sweet yummy and by all means no vegan health food but it’s very kiwi and super delish after all. Opening hours: Mon – Sun 7.00am – 4.00pm. I was super happy to see that a new vegan joint had opened in Parnell and my expectations were pretty high. The place looked lovely and had a cozy deli feel to it. Unfortunately, it didn’t really fulfill my expectations from a food perspective. In saying that, the staff was a bit unorganized and they didn’t have dishes shown on the menu like the nut cheese platter (which I really wanted to try). So I ordered a lox bagel (vegan salmon made from carrots) with cream cheese and a passionfruit coconut smoothie. There wasn’t a lot of love around the presentation of the food and the $13 smoothie came 10 minutes later than the bagel. Both tasted ok but not great. But, the cabinet food looked really good though. There was vegan lasagna and a selection of yummy sandwiches which might be worth trying. To me atmosphere, staff and food presentation just really make a place special and Kaiaroha just weren’t up to it. This might have been due to the fact that they just had opened. I heard so many good things about this breakfast and lunch joint but unfortunately, I didn’t have time to check it out. 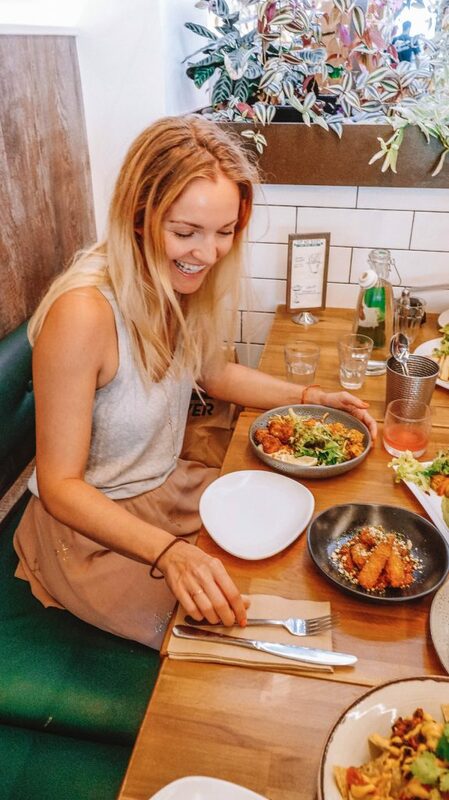 They have heaps of veg options and all dishes are gluten and dairy free, everything on the menu is organic and as local as possible. For lunch they have a bowl menu featuring dishes like the Nordic bowl with roasted organic kumara, sauerkraut, smoked beetroot, creamy caper sauce, witloof & mesclun salad and walnuts. From what I can tell from their website the sweets and cakes all look spot on delicious as well. Probably the best ice cream shop in town. Its sort of a legend here and has been around for many years. Literally, everyone knows Giapo in Auckland! And ice cream is really good! they even have a special ice cream menu for vegans. The Millers coffee and hazelnut was by far my favorite. When you enter Giapo they usually let you do an ice cream amazing so you can at least taste 6 different vegan ice cream variations. Also, ice cream cones are also plant-based and you can get your ice cream fix on a donut or a Maori fried bread too! Giapo opens late so you can get your ice cream fix until 10.30pm in the night. Wise Cicada is actually the biggest supermarket in the whole of New Zealand to stock up on organic foods. By means, it has been an institution in Auckland for many years. 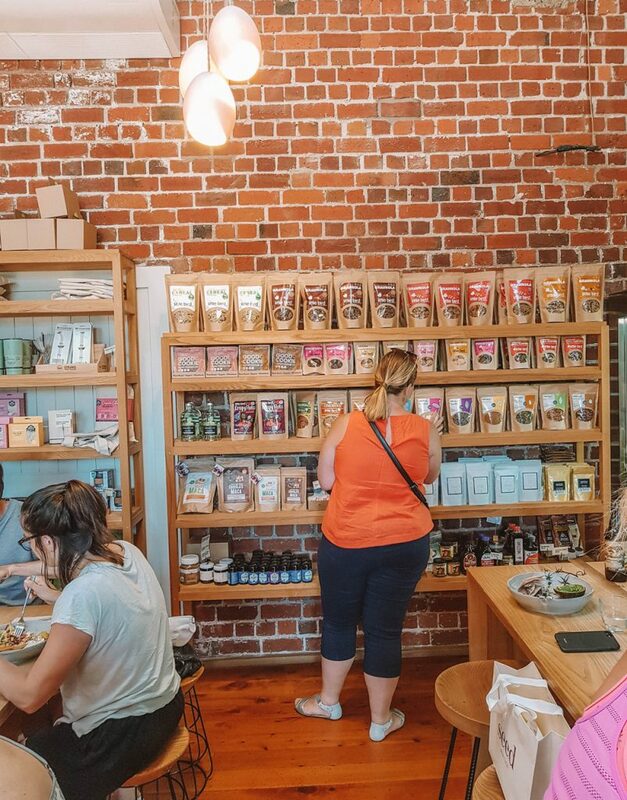 Wise Cicada started with a small supermarket in Newmarket and I am super happy to report they have moved to a huge place in Newmarket selling everything from organic food, natural cosmetics, household items, to zero waste equipment. They do have a beautiful cafe too serving up amazing lunch salads and cake to die for. All cake slices are naturally vegan, sugar- and gluten-free. You are always spoiled for choice here. It’s lovely but definitely more a casual cafe which is also very kid friendly. I was not planning to include any places around Auckland in the first place. But this place, OMG deserves so much love for their food and their passion for the plant-based lifestyle. Hapi is nestled in a street in beautiful Hawkes Bay in Napier. 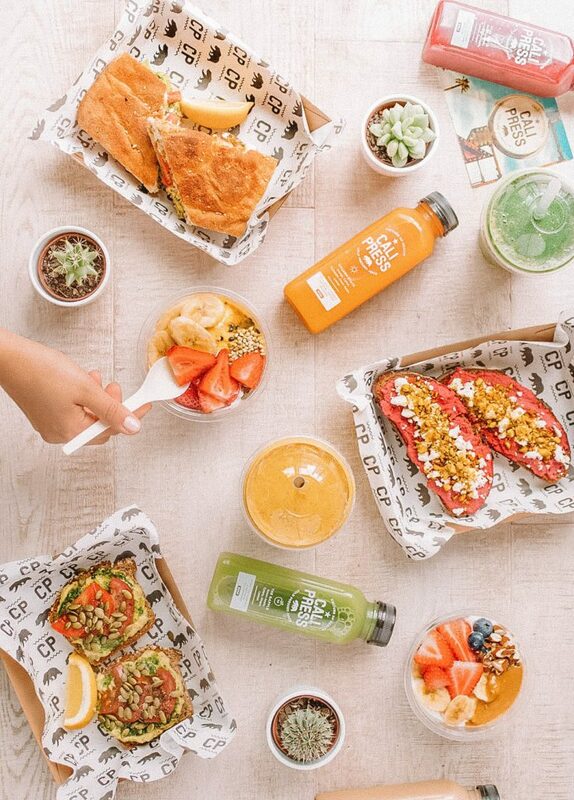 It’s a small cafe filled to the rim with plant-based sandwiches, Mac and cheese boxes, coffee and amazing raw vegan treats. BUt most importantly, they also have a big fridge with homemade vegan cheeses, juices and coconut yogurt for you to take home. We had a tofu sandwich, the Mac and cheese and the slice to go. I don’t think the sandwich could have been any more delicious and satisfying. I wish I did have more time to try their other dishes but I am hoping one of you guys can come here and try more of their menus. Well, there is my ultimate foodie guide to Auckland, for now. The restuarant scene is sofats paced that it is almost imposible to be up to date. But I’ll be adding any new favourites as I find them. 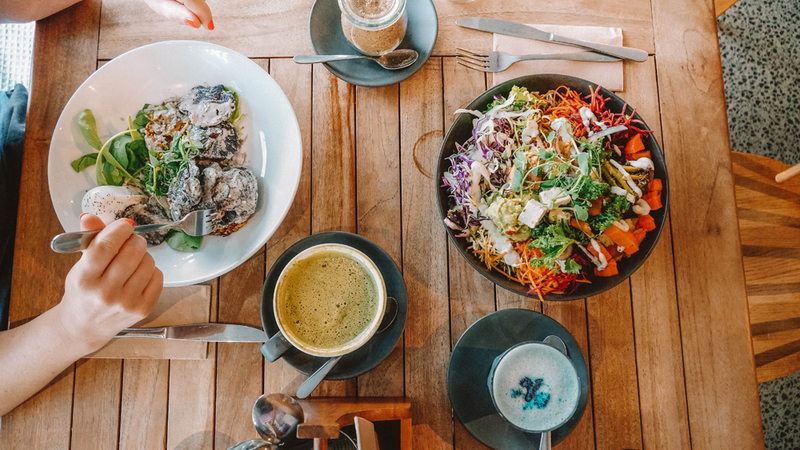 I hope you loved my Vegan Food Guide to Auckland!! Drop a comment if you have any feedback or suggestions for places I have missed. 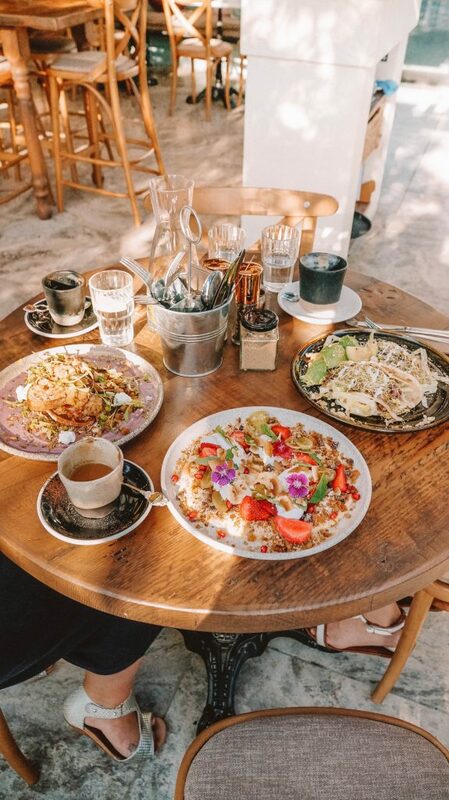 If you are a travel foodie like me, you might also enjoy my Vegan Foodguide to Patagonia, Dessert Guide to Berlin, and my Vegan Festival Guide!